1. The flu vaccine is essential for children. Each year, on average, 5% to 20% of the U.S. population gets the flu & more than 200,000 people are hospitalized from complications. In the U.S. alone, 180 pediatric deaths were reported to the Center for Disease Control & Prevention (CDC) during the 2017-2018 flu season–most were children did not receive their flu shots. The American Academy of Pediatrics & the CDC both recommend annual influenza immunization for all people ages 6 months & older, including children & adolescents. In addition, household contacts & out-of-home caregivers of children with high risk conditions & all children under the age of 5 especially should be vaccinated. Young children, people with asthma, heart disease, diabetes, weakened immune systems, & pregnant women are at high risk for complications of influenza, such as pneumonia. About half of all Americans get vaccinated against the flu each year. 2. Now is the time to get vaccinated. Influenza vaccine shipments have already begun, and will continue through the fall and winter. Infants and children up to 8 years of age receiving the flu shot for the first time may need two doses of the vaccine, administered four weeks apart. It is important that these children get their first dose as soon as possible to be sure they can complete both doses before the flu season begins. 3. This year’s flu vaccine is only available as a shot. The inactivated influenza vaccine (IIV) is given by intramuscular injection & is approved for children 6 months of age and older. The intranasal influenza vaccine is not recommended in any setting in the U.S. 4. You can’t get the flu from the flu vaccine. Flu vaccines are made from killed viruses. Mild symptoms, such as nausea, fatigue, headache, muscle aches, & chills, can occur. The side effects of the flu vaccine are mild (and nothing compared to having the flu). The most common side effects are pain and tenderness at the site of injection. Fever is also seen within 24 hours after immunization in approximately 10% to 35% of children younger than 2 years of age but rarely in older children and adults. These symptoms are usually mild & resolve on their own in a couple of days. 5. If you catch the flu and are vaccinated, you will get a milder form of the disease. We know that flu vaccines are about 60% effective–yes, we all wish that number were higher. The good news is that vaccinated people who get the flu usually get a mild form of the disease, according to a study. People who are not vaccinated will likely be in bed with fever & miserable and even could develop a complication. 6. The influenza vaccine doesn’t cause autism. A robust body of research continues to show that the influenza vaccine is safe & is not associated with autism. 7. The flu vaccine can be given at the same time as other vaccines. The flu vaccine may be given at the same time as other vaccines, but at a different place on the body. It is also important to note that children 6 months through 8 years of age may need two doses spaced one month apart to be fully protected. These children should receive their first dose as soon as the vaccine is available in their community. Live vaccines (like the MMR and chickenpox vaccines) may be given together or at least 4 weeks apart. 8. Children with egg allergy can get the flu vaccine. Children with an egg allergy can safely get the flu shot from their pediatrician without going to an allergy specialist. Even those with a history of severe egg allergy don’t have to treat getting the flu vaccine differently than getting any other vaccine, because these people are not likely to have a reaction to the flu vaccine. Recently we launched our “new & improved” Hometown Pediatrics website! While we loved our old, original site, we understood that our patients’ families needed better access while “on the go” — so a mobile device friendly site was constructed & now fully launched! An added benefit in order to save time (and paper!) is that we have improved the ability for our families to submit or update patient forms. Our forms are now “fillable” using Adobe Acrobat to create completed and even electronically-signed pdfs. These can then either be printed and carried in, or, saved on one’s computer and then submitted electronically! Of course for privacy and safety, all submitted forms are encrypted. Beginning July 9th, 2018, Dr. Amanda Hathaway, another board-certified pediatrician, will join Hometown Pediatrics! Dr. Hathaway received her medical degree in 2009 from the University of Texas Medical School at Houston. She continued her pediatrics residency at the same school, where she took care of patients at Children’s Memorial Hermann Hospital in the Texas Medical Center and LBJ Hospital. 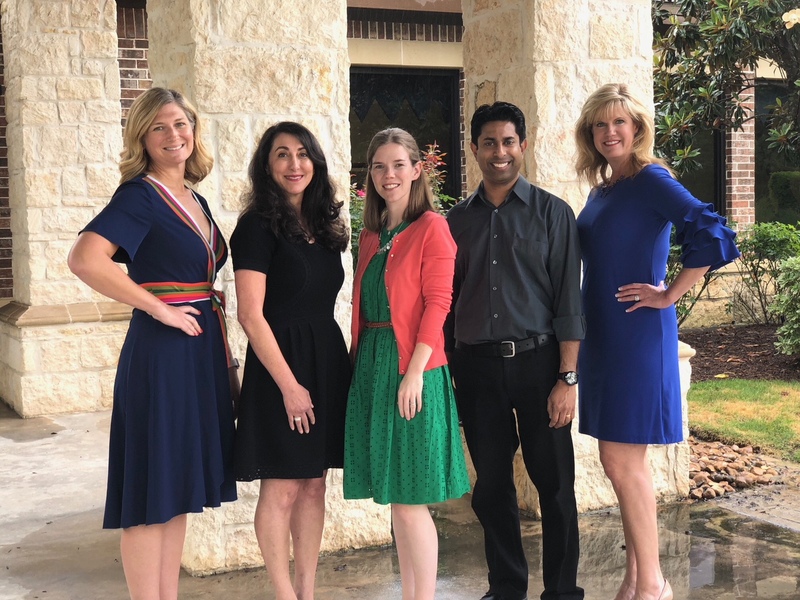 Having lived in The Woodlands since birth until college, she first returned “home” after residency to practice as a newborn and pediatric hospitalist at Memorial Hermann The Woodlands, Houston Northwest Medical Center and Tomball Regional Medical Center. Dr. Hathaway is a life-long Houston Astros fan and loves to watch (and try to play!) just about any sport. She enjoys sharing her enthusiasm for athletics with her husband and 2 kids! We are already booking appointments for Dr. Hathaway – simply call today to schedule! Hometown Pediatrics opened the doors of its new 11,000 square foot clinic in the heart of “downtown” The Woodlands in August of 2005. Despite an ever-increasing volume of patients, at Hometown Pediatrics our vision remains unchanged through the years. To practice state of the art medical care while maintaining a warm, friendly, service-oriented environment for the entire family. © Hometown Pediatrics, P.A. All Rights Reserved. Site Design & Hosting by Johnnyo Design.